LeBron James’ free agency inches closer. Could he land with the Sixers? LeBron James has several admirers in the Eagles' locker room. It's time for all of the discussion and speculation about LeBron James' next move to escalate. His future plans have been a hot topic since the beginning of the season. It's no secret he intends to opt out of the final year of his deal with the Cleveland Cavaliers and become an unrestricted free agent on July 1. For the next three weeks, we can brace for an onslaught of intense dialogue about James' future now that the four-time NBA MVP's season has concluded. The Golden State Warriors clinched their second straight NBA title and third in four years, capping a four-game sweep over the James-led Cavaliers with Friday night's 108-85 victory at Quicken Loans Arena. It marked James' eighth consecutive NBA Finals appearances. So will he remain with the Cavs, who he led to four straight NBA Finals, winning the title in 2016? Will he go to the Los Angeles Lakers, where James can become a part of the rebuilding process and be closer to Hollywood? Joel Embiid (right) will likely restart his recruitment for LeBron James this summer. What about joining the Houston Rockets, who lost to the Warriors in seven games in the Western Conference finals? That move would enable him to join forces with close friend Chris Paul and MVP candidate James Harden, assuming Paul re-signs with the Rockets. Would James come to Philly, and help the 76ers complete the process? Or will he pick from a list that includes the Warriors, Boston Celtics or the Miami Heat, the team James led to four straight NBA Finals appearances from 2011-14. Most rumors have linked James to the Cavs, Lakers, Rockets, and Sixers. >>READ MORE: Can the Sixers afford a super team? Oklahoma City all-star small forward Paul George is arguably a better free-agent option for the Sixers than James, who will turn 34 at the end of December. At 28, George is 5 1/2 years younger than James. He's also a better fit to pair with all-star center Joel Embiid and point guard Ben Simmons. George is a great shooter and has been an All-NBA first-team defender. Most importantly, he's not ball dominant, like Simmons and James are. But that's not to say that James is Plan B. The 14-time all-star is regarded as the best player in the world and on top of every team's free-agent wish list. The three-time NBA champion would instantly become the unquestioned team leader. He and Simmons are both represented by agent Rich Paul of Klutch Sports. James is also Simmons' mentor. As a result, the two shouldn't have a problem playing together for a couple of seasons. 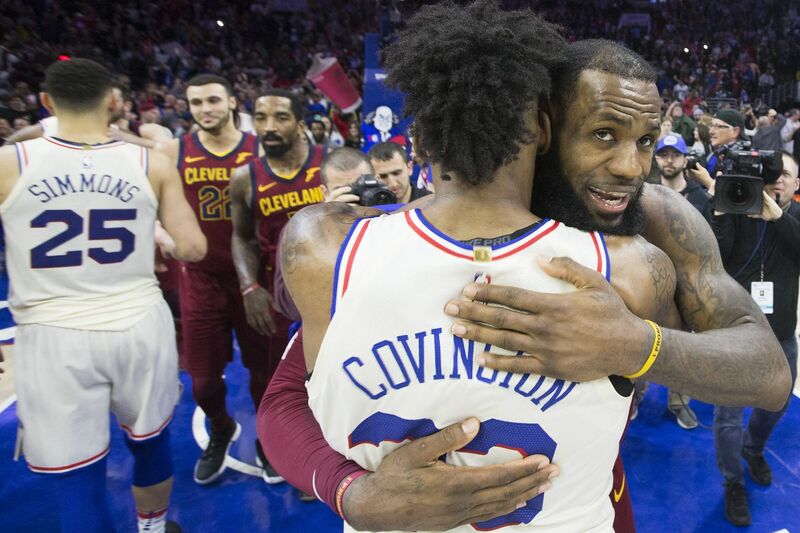 Embiid continued his recruitment of James as the Cavs season ended. He tweeted "Trust The Process!!!! Find a new slant @KingJames"
George, meanwhile, is expected to sign a free-agent deal with his hometown Lakers. The team has enough cap space to sign two maximum-salary players. As a result, James and George could form a talented duo in Southern California. That would also enable James to be mentored on life after basketball by Magic Johnson, the Lakers' president of basketball operation. One of Johnson's business ventures is Magic Johnson Enterprises, a conglomerate that has a net worth of $700 million. The former co-owner of the Los Angeles Dodgers and Lakers made several investments that were as successful as his Hall of Fame playing career with the Lakers. Meanwhile, James, whose family lived in Los Angeles this year, has been building up his portfolio over the years. James is the co-owner of SpringHill Entertainment, the company that produces four television shows (NBC's game show The Wall, STARZ's Survivor's Remorse, Disney XD's Becoming and CNBC's Cleveland Hustle), produced two movies ("More than a Game" and "I am Giant: Victor Cruz) and is behind the multimedia company Uninterrupted. Making money off the court is common for James. He received a 2 percent stake in the Liverpool Football Club of the English Premier League for approximately $6.5 million in 2011. ESPN reports that James' stake is now valued at $32 million. He also profits from investments with Beats by Dre and the Blaze Pizza franchise. And there's more. James signed a $90 million endorsement deal with Nike as an 18-year-old. Then in 2015, the shoe company gave him a lifetime contract with the potential to earn $1 billion. James also has endorsement deals with Kia Motors, Coca-Cola, Verizon, and Intel. According to Forbes, James was worth $485 million as of February 2018. Despite all that, he could opt to play with Paul and Harden in Houston. They would be a championship-caliber grouping. But one has to assume that remaining in the Eastern Conference would still be James' best shot at reaching the NBA Finals. As a Rocket, he would have to compete with the Warriors and to a lesser extent the Portland Trail Blazers, New Orleans Pelicans and San Antonio Spurs to get out of the West. To get back for his ninth straight Finals appearance, he would receive less resistance in the East by joining the Sixers or remaining in Cleveland. By staying in Cleveland, he will continue to be paired with all-star Kevin Love. George Hill, Jordan Clarkson, Larry Nance Jr. and Rodney Hood — the four players the team acquired in February trades — will be more indoctrinated into the system. The Cavs should also get a solid rookie addition with the eighth overall pick in the June 21 draft. Perhaps the biggest draw to remaining in Cleveland is that Northeast Ohio is home to the Akron native. James also remembers the criticism he received for the ESPN special titled The Decision on July 8, 2010, when he announced he was leaving Ohio and would sign with the Miami Heat after playing his first seven seasons with the Cavs. James righted all wrongs after revealing on July 11, 2014, through Sports Illustrated, that he would rejoin the Cavs. He went on to lead Cleveland to the city's first sports championship in 52 years in 2016. However, James' relationship with Cavs owner Dan Gilbert is reportedly rocky. So the upcoming weeks are going to be interesting.